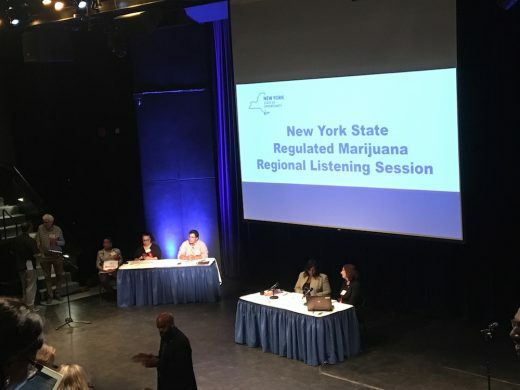 When Governor Cuomo’s office announced a series of statewide “marijuana listening sessions” to get community feedback when drafting legislation for legal adult use, many rushed to make jokes; the name conjured images of stoned people jamming to records. But recreational cannabis use was one of the last things on the minds of those at last night’s Manhattan session. 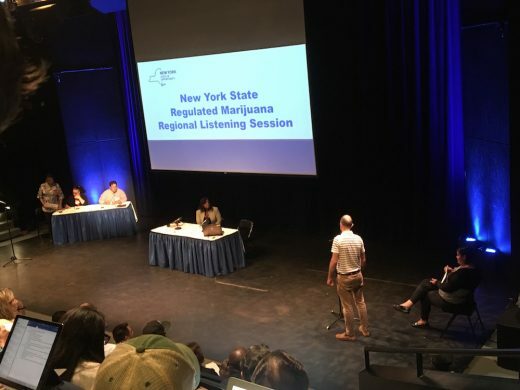 Rather, the two-hour event at BMCC’s Tribeca Performing Arts Center was rife with dialogue surrounding the potentials and risks this type of historic legalization could bring, and how New York might be able to get it right. Alyson Silkowski, speaking on behalf of Comptroller Scott Stringer, noted he also strongly supports legalization, saying there must be “regulatory frameworks” enacted to “repair past harms” done to the “tens of thousands of our neighbors” impacted most by prohibition, and to prevent any more harm from being done. Countless statements urged the administration to prioritize the needs of people of color, particularly Black and Latinx communities, who experience the most cannabis-related arrests within the city. Data from the New York State Division of Criminal Justice Services reported by The Innocence Project found 93% of New Yorkers arrested for cannabis from January to March 2018 were people of color, despite white people reporting similar usage rates. Legalization could birth an industry taken over by the top 1% as soon as they get the chance. Legislation could help empower smaller businesses run by women and people of color instead. Stringer’s statement said the cannabis industry in New York could reach $3.1 billion statewide; the Department of Health’s impact assessment estimates it could bring $248-677 million in tax revenue in its first year. Several people cited the Marijuana Legalization and Taxation Act (MRTA), a bill sponsored by State Senator Liz Krueger that would legalize marijuana for adults over 21 and resentence and seal criminal records of those previously convicted, as an admirable model. Cesar Soriano, a High Times contributor who has been arrested “several times” on weed-related charges in New York City, expressed concern that his (and other’s) record and lack of wealth would prevent him from working in the legal weed industry. Meryl Montgomery, co-founder of an herb-centric shop called Barbari, noted that the legislation should also consider commuters, as transporting marijuana across state lines is currently a federal felony. Many expressed dissatisfaction with New York’s current medical marijuana program, from its cost and doctor selection to the fact that some people don’t even know it exists. Yolanda Allison, a former NYPD employee now on “permanent disability” following an injury, said she pays $400 for a vape pen and “30 capsules” that last her less than a month. Soon, she said, Con Ed will cut her lights. The medical program should be expanded and preserved, several said, even if recreational use is legalized. Allison Kane, a bartender who uses CBD oil to cope with debilitating panic attacks, explained cannabis can be “a necessity.” Another young woman said she was raised on DARE, but now finds cannabis and CBD has “done miracles” for her depression and suicidal ideation. Others praised cannabis’s role as an “exit drug” for those trying to decrease or cease opioid use, significant in light of America’s growing opioid epidemic. Joshua Rein, a Mt. Sinai doctor specializing in kidneys, wants the legislation to set aside money for medical research. John, a “CBD hemp grower” from Harlem, hopes SUNY medical schools will implement medical marijuana-focused curriculums. Naysayers were scarce but present, demonstrating perhaps how truly widespread cannabis use has become: one man who identified as a Navy vet and community board affiliate urged the crowd to consider “the rights of the non-smoker.” Another woman said smoke in her hallway aggravates her asthma. This, plus fears of NYCHA residents being punished for smoking in their residences and reminders of the city’s strict smoking laws, led to repeated requests for “consumption lounges” like in Vegas, or Amsterdam-style coffee shops. Growing plants in private residences (known as “home grow”) was also rallied for. Other environmental effects were considered—a doctor of physical therapy cited “wasteful” plastic packaging in legal states, as well as a need for regulation surrounding pesticide use and greenhouse energy consumption. The DOH’s impact assessment concluded the positive effects of legalization outweigh the “potential negative effects,” but it’s anyone’s guess how (or if) the statements heard will be incorporated into future legislation. “This cannabis industry has the potential to be the one industry that is not dominated by wealthy white men. If you allow to happen what has happened in our medicinal program, we will literally be selling cannabis to the highest bidder,” said Tanya Osborne, the New York market leader for Women Grow, an organization empowering women in the cannabis industry. The remainder of the Regulated Marijuana Listening Sessions, including ones in Brooklyn, Queens, and Staten Island, can be found here. Update, September 21: The original version of the article was amended to correct the spelling of Alyson Silkowski’s name.